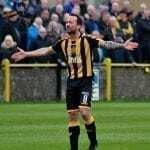 Talbot did the heavy lifting last week away at Dundee and made light work of this 2nd leg tie; strolling to a 6-1 aggregate win to book their place in their 3rd consecutive Junior cup final where they will face Largs Thistle, ensuring that one way or another there will be black & gold ribbons round the cup. Lochee had a mountain to climb after last week & at no stage did they look like scaling it. The first chance of the match came Talbot’s way after 5 minutes. Samson hared away on the right & squared it across goal where Graham Wilson met it. He was shut down but the ball broke to Glasgow and his side-footer was heading on target til blocked by a defender. Both sides were a bit at sea in the opening exchanges, with passes & crosses going astray and neither keeper looking like being called into action, at least until the 18th minute when Talbot broke the deadlock. Stephen Wilson started and finished the move. He won it down the stand side before releasing Samson up the wing. 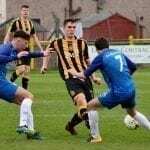 His cross into the centre was headed out but only came as far as STEPHEN WILSON who hit a dipping, swerving effort over Millar from 18 yards to put Talbot 1-0 ahead. 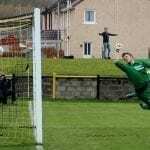 Two minutes later and only a great double save and an uncharacteristic miss prevented Talbot from doubling their lead. Glasgow broke free on the left of the area & drilled a low shot on target that Millar did well to block. The rebound came straight to Samson and he must have thought he’d scored when he fired it goal ward but Millar showed great reactions to recover from his earlier save to get up and block Samson’s effort. The danger wasn’t over though as the ball came to Glasgow on the left. 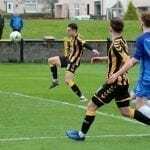 He clipped a cross into the centre where careless defending by both Lochee centre halves saw the ball finish up at Graham Wilson a few yards out from goal. 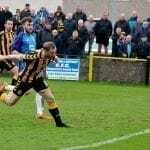 He had his back to goal & swivelled round before firing over the bar from close range. 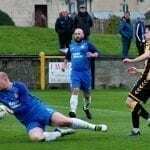 Lochee had a rare chance to test the Talbot defence in the 22nd minute. 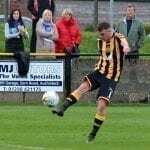 McCracken was penalised for a barge on Birse & Cameron took the free kick; whipping a dangerous ball in from the right that Pope did well to head behind for a corner. Cameron fired the corner into the goal mouth where Leishman punched the ball to safety. With 27 mins gone Talbot doubled their lead. Hyslop was caught as he shoved the ball down the line to Glasgow but the referee played advantage. Glasgow fired it across goal where GRAHAM WILSON tucked it home. It was all Talbot and the Bot nearly added another in the 33rd minute. White released Glasgow down the left and he lifted a cross to the back post where Samson just failed to connect with it. 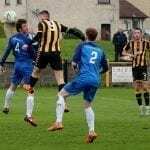 A minute later a mix up in the Lochee defence allowed Samson to burst clear down the right. He raced into the area and it knocked it wide of Millar who looked to bring him down but the referee thought otherwise and booked Samson for simulation. Talbot’s next chance came in the 39th minute. 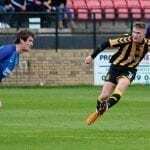 Lyle pinged the ball down the line to Samson and when his cross came over Graham Wilson powered a header on target but unfortunately it flew straight at the keeper. In the final minute of the half Birse was penalised for persistent fouling to end a frustrating half for the visitors. The 2nd half was only 5 minutes old when Lochee made their first change; McDonald coming on in place of Kirk. 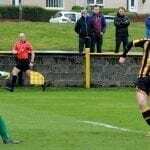 In the 55th minute Talbot came close to extending their lead when they won a free kick 25 yards out following a foul on Samson. Graham Wilson whipped it up and over the wall and had the keeper beaten but it flew just the wrong side of the left upright. 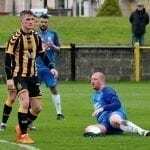 Action then switched to the other end where Lawson fed the ball out to McWalter on the right wing and he swept a cross over onto the head of the unmarked Devie who headed just over the bar in what proved to be Lochee’s only real chance of the afternoon. 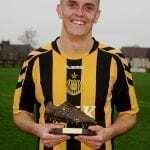 Tucker now made a change with McIlroy on for Graham Wilson and Lochee soon made their 2nd change with Deasley making way for Ritchie. 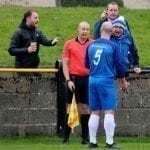 With 62 mins gone frustration got the better of Cameron who picked up a needless booking for kicking the ball away. In the 65th minute Tucker completed Talbot’s changes with a double substitution; Armstrong & Kemp coming on in place of Hyslop & Samson. Leishman was barely tested all afternoon & in fact his best save came 20 minutes from the end when he had to stretch up and pluck the ball out the air when Lyle chested the ball back to him and it took a high bounce. Ten minutes from the end McWalter received a caution when he went right through Glasgow. Pope took the free kick & shoved it to White who in turn fed the ball into the area to Kemp. He teed it back up for White who drilled a low shot just wide of the right post. With two minutes remaining Talbot had one final chance to add to their tally. Pope gathered on the left & was allowed to carry it forward unhindered before firing for goal from 20 yards. His shot took a slight deflection and Millar did well to dive to his right to make the stop. All in all a very comfortable outing for Talbot who never really looked in any danger. 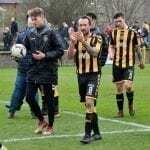 Next up for Talbot it is back to league duties and the start of the midweek fixtures as they travel through to Lochburn park to face Clydebank this Wednesday evening.